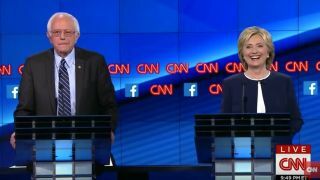 The CNN Presidential Democratic Debate has wrapped in Las Vegas, and viewers saw a fairly civil exchange about the issues facing the United States (albeit one less entertaining than provided by the candidates' Republican counterparts). All that's left to do now is hash out who won (many believe Bernie Sanders performed the best), sober up from your debate drinking games and take a look at some of the biggest moments from the night's contest. Sanders had THE moment of the night when addressing the email scandal that has dogged Hillary Clinton's campaign. Clinton has come under fire for using email addresses tied to a private server for both personal and work correspondence while she was Secretary of State. The email scandal is a nagging sore on her run for the White House, undermines her credibility, and is a favorite point of attack for the Republican Party. However, when it came up during tonight's debate, Clinton's biggest opponent for the Democratic nomination basically said, enough is enough. Sanders prefaced his remarks by saying "it may not be great politics," and declared, "the American people are sick and tired of hearing about your damn emails!" He called for discussion on "the real issues facing America." You can see Sanders remarks in the video below, which led to Clinton extending her hand and thanking the senator from Vermont. Moderator Anderson Cooper posed to the candidates: Is Edward Snowden, the NSA leaker who exposed a massive program of government surveillance, a hero or a traitor? No one called him either directly, but the candidates' views on Snowden, who is living in asylum in Russia and recently joined Twitter, spanned the spectrum. Long-shot candidate and former Governor of Rhode Island Lincoln Chafee said he would bring Snowden back to the US without facing penalties for taking documents from the NSA, which itself was acting illegally in collecting data from citizens, he said. Sanders had a more punitive opinion, noting that while we learned a great deal about government surveillance because of Snowden, he should still face a penalty if he returns to the United States. Sanders finished by saying, "what [Snowden] did in educating us should be taken into consideration" when it comes to determining a penalty. Both Clinton and former Maryland Governor Martin O'Malley took the staunchest stances, saying Snowden should face the music for the theft and leaking of NSA documents. Clinton said Snowden "could have been a whistleblower" who received protections and still "raised all the issues that he has raised." She added that Snowden "stole very important information that has unfortunately fallen into a lot of wrong hands." (Some argue Snowden wouldn't have had whistleblower protections, however). O'Malley said this: "Snowden put a lot of Americans' lives at risk. Snowden broke the law. Whistleblowers do not run to Russia and try to get projection from [Russian President Vladimir] Putin." Finally, former Virginia Senator Jim Webb skirted addressing Snowden's situation directly, saying the legal system would ultimately levy judgment. He did attack the massive collection and storage of citizens' personal data, and spoke to his track record of introducing reforms to the process. He lobbied for the "vast data bank of information" held by the government to be destroyed before it falls into the wrong hands. The candidates squared off on a wide range of topics: according to ABC News, gun control, Russia and Syria, economic issues, college costs and climate change were the most mentioned issues. The candidates' goals often met one another, such as providing free college education, but, as Clinton noted during the debate, the way they want to achieve these goals is where their differences arise. As far as the impact of the debate, Bernie Sanders gained the most Twitter followers with Clinton gaining a distant second, according to Yahoo! News. Sanders was also the most searched candidate on Google after the debate. The next Democratic debate takes place November 14. Until then, the Republican field is readying for its upcoming debate on October 28. While he'll be busy later this month, we don't think Donald Trump will refrain from live tweeting the next Democratic debate, just like he did Tuesday.